The 2017 Tax Cuts and Jobs Act was officially signed in to law on December 22, 2017. This is the most sweeping tax legislation in more than three decades, and it affects both individuals and businesses. The most significant change for most people and businesses will be the lowering of the tax rates. Individually, there are still seven rates, with the top rate dropping to 37%. 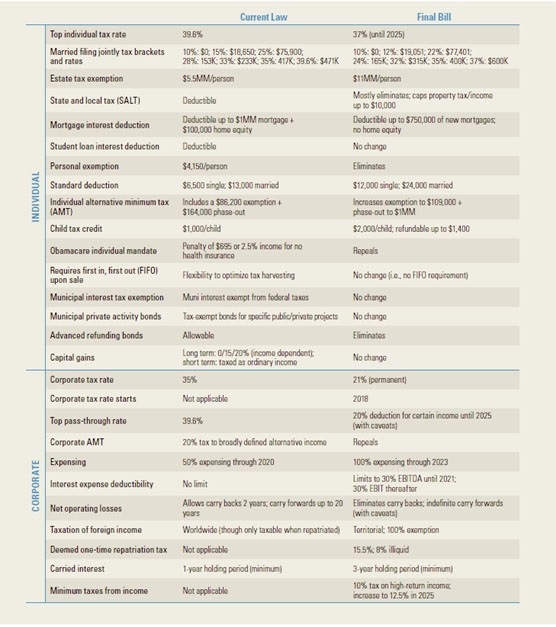 Many itemized deductions were eliminated and the standard deduction almost doubled. The penalty for those who do not have health insurance was also eliminated, which essentially puts an end to the individual mandate of the Affordable Care Act. For businesses, the big change was that the corporate tax rate drops drastically to 21%. Below is a summary of a majority of the changes. If you have questions, I’d be happy to work with your tax advisor to determine any adjustment in strategy that may be needed in response to these tax changes. Source: LPL Research, Joint Committee on Taxation, Senate Finance Committee, House Ways and Means Committee, PIMCO 12/26/17 All information is believed to be from reliable sources; however, we make no representation as to its completeness or accuracy. This information is not intended to be a substitute for specific individualized tax or legal advice.